We’ve been trying to figure out what to do about the Disk subsystem IO problems we have. We spent many hours talking to vendors, trusted advisers (ok, reaaaally smart people who were willing to help us – and put up with our questions), and each other trying to find the best solution. We think we have, for now. Before I get into what we decided to do I want to talk a little about our thought process and the requirements we put together to shape our decision. The primary requirement of this upgrade was to get more speed out of our storage subsystem, so it makes no sense to spend $100k or more on a SAN with a whole bunch of features that we won’t use in the next 6-12 months. But we don’t want to spend the least amount of money we possibly can on equipment, either. Like Goldilocks, we needed to find a solution that was just right. By safety, I mean our data won’t go up in smoke when there is a catastrophic failure — and it needs to keep our services running briskly without a ton of overhead, either mental or physical. We’re not a bank, and we don’t need to over-build our systems to never lose a single bit and always be 100% accurate. But we also respect that you put a lot of effort into making this place great, and we owe it to you to treat the content you’ve contributed with care. Putting aside all the cool stuff, all the other feature options, does spending X on storage technology Y give us the best price/performance? The first thing we did is to explore the different classes of server storage, and look at the pros and cons of each. Pros: Fairly low cost, although more expensive than internal storage. You get a large number of spindles to run faster with. Cons: Normally can only be connected to a low number of hosts (1-4), for what you get, it’s a large investment. 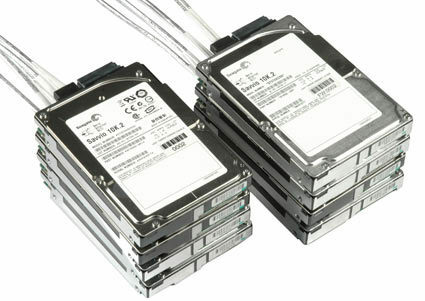 Pros: Flexible storage, generally expandable (for a price), lots of disks. Cons: Very expensive. And to get the best performance we would need an infrastructure upgrade as well, either 10 Gigabit Ethernet or Fibre Channel. Pros: ridiculously fast. not a horrible price. Did i mention F-A-S-T FAST? Cons: relatively new tech, giant single point of failure with no great way to compensate for it. Pros: Fast, potentially really fast. flexibility for future upgrades without sinking too much money into one technology. Cons: Have to get non-vendor “approved” drives, since our vendor wanted insane amounts of money for a single drive. We had grandiose plans to bring a few of the finalist options in house to do a barrage of tests, but this turned out to be harder than we thought. Storage vendors were really reluctant to allow us to bring in demo units of their hardware. When I’m looking to spend tens of thousands of dollars, I’m sorry, but I really want to either a) go to your lab and actually run test against a unit that I’m going to be buying, or b) bring a unit in house for a few weeks or a month and be able to verify that the unit will do what you claim it will. What actually happened was that we only brought in one option: the Intel X25-E solid state hard drive. The price wasn’t too expensive to bring them in on a flier, and if they didn’t work out we would be able to re-purpose them somewhere else so it wouldn’t be a total loss. 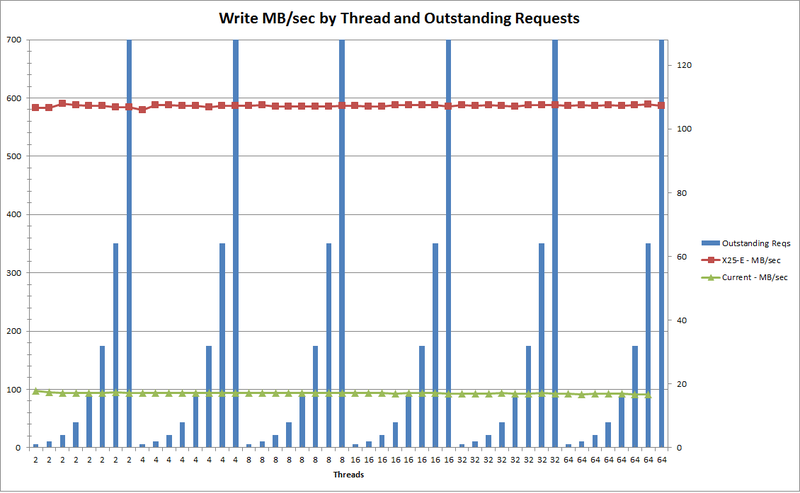 We decided to use Brent Ozar’s benchmark that he did on the FusionIO drives as our benchmark. Brent isn’t some random blogger, you understand — he is a database ninja. When he does a benchmark, he does a benchmark. The numbers for the X-25’s are actually limited by the controller since the H700 has a max throughput of 600MBps. We do not know how much faster this setup could go if we put a higher throughput controller in the boxes. We ended up not bringing in any of the SANs due to the amazing performance we got out of the Intel X25 solid state drives. Speed was all we were really after. We don’t seen the need for a SAN at this point so we’ll let that money continue to earn interest in the bank for now. The full test that we ended up running was straight out of – you guessed it – Brent Ozar’s playbook. That us, using SQLIO to run a whole barrage of tests against the storage system. The gold standard for fast is the FusionIO drives. 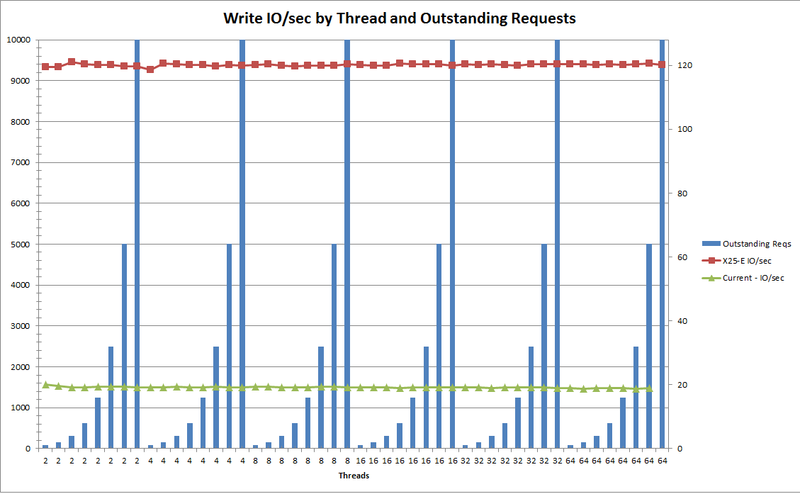 In our benchmarking, a RAID 10 array of Intel X25 drives got within about 25% of FusionIO performance for reads, and within 10% for writes. That exceeded everyone’s expectations and made our decision very easy. Six X25-E’s are about half the list price of one FusionIO, and putting them in a RAID array eases any concerns about reliability. For all who are interested the raw data can be found in this archive. The archive also includes a pretty ugly Perl script that converts the raw output from SQLIO into a csv file. > I would like to take a moment to thank all the people who helped us out looking at all these options. > > – Our vendors who put up with insane questions and flip floppery – Dell, CDW, and Fusion-IO. > – All of the regulars in the Server Fault chat room. > – Of course Brent Ozar who … is … godlike? Hmm, let’s just go with “great guy”. « What to do about Storage? Be very careful. The Intel/2.5″ SATA SSD market in general has had crazy high failure rates. I’m not talking bit or bytes bad whole disks just going south. I’m not Brent but I do some benchmarking and work with storage a bit. I post that up at http://www.sqlserverio.com if you have any questions just drop me a line! “I’m not Brent” – hahaha, you rock, sir. You ain’t got nothin’ to be ashamed of. WOW! You’re too kind, sir. Always a pleasure working with you guys. It’s amazing what you can do without the “Enterprise” groupthink/mindset. If you pitched this at the great big enterprisy bureaucracy I work in, you’d be laughed at and given a thousand and one reasons why it could never work. Still I wonder though, won’t putting a bunch of SSD behind a RAID controller (which basically abstracts away the fact that it is an SSD from the OS) keep SSD maintenance tasks like TRIM from running, i.e. won’t it seriously reduce the expected lifetime of an SSD? But as long as you keep 10~20% free space on each drive, you should be able to rely on the drive’s internal controller’s periodic idle-time garbage collection feature. When I partition my SSDs in RAID, I usually only partition 80% of the available space to ensure that buffer is left open. So is TRIM running on the X25 RAID 10? If so, anything special needed to make it so? How did you get around the clustering problem? Will be interesting to see what speeds these drives give after a bit of usage. Also how quickly they die under intensive use. You say “and putting them in a RAID array eases any concerns about reliability”. What about garbage collection (i.e. TRIM ATA command)? Currently that i know if, no hardware RAID card supports TRIM, so as you see good performance now, that can degrade over time as your NAND cells are consumed if you aren’t performing proper garbage collection. As of Server 2008 R2 it is supported, but no support for RAID cards of as of yet (that i have heard of, to this date). I only ask this because I am looking at this kind of solution for my professional and personal business and dont want to back ourselves into a corner. How’s this working out 10 months on? Great write up.. thanks!! How have things worked out after two years?